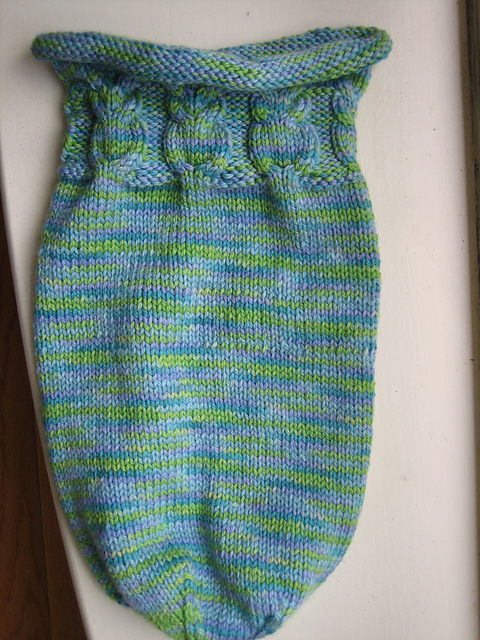 A most unusual occurrence this summer… I kept knitting! I typically find I lose the motivation to knit in summer months; there are just too many other things to do. But for some reason this year I’ve kept up with it and as a result I think I’m actually going to do really well with making gifts for loved ones this year. See, every January I sit down and make a new “Project” sheet which lists birthdays and things I might like to knit for each person. At the bottom I create another list called “Yule” where I jot down people I’d like to knit a little something up for for stocking stuffer type gift, as well as bigger gifts for family members. Finally, I make a smaller list of things I just want to try for the fun of it or to make up for myself. Naturally, after all that work (setting up the list is half the fun )… I suddenly find myself in October with 5 different birthdays and the holidays (and yet more birthdays) looming just beyond… and I’ve hardly knitted a thing! 1. Another pair of the Alice In Wonderland fingerless mitts for my mother-in-law. She specifically mentioned how much she liked them when I showed her the pair I had knitted up for myself. She’s a composer and her hands get chilly in the winter when she’s working at the piano. 2. 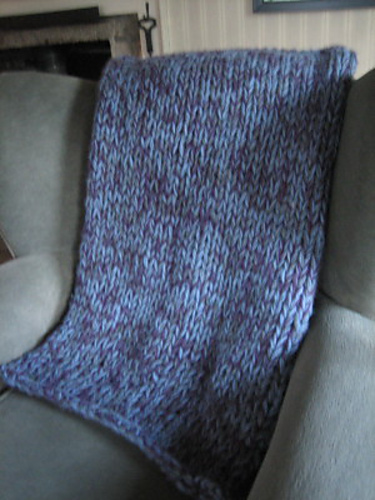 A toddler blanket for my nephew (see photo) When he was up visiting this summer, he LOVED the 6-hour throw I made. So I decided to make him a smaller version, using a different yarn (I despise Homespun!!). 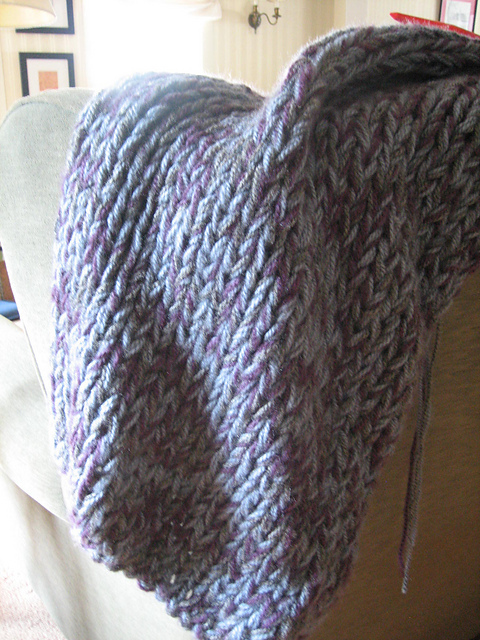 I used the Jiffy yarn, because although I don’t like acrylic, I wanted it to be wash and dry for ease of care. 3. 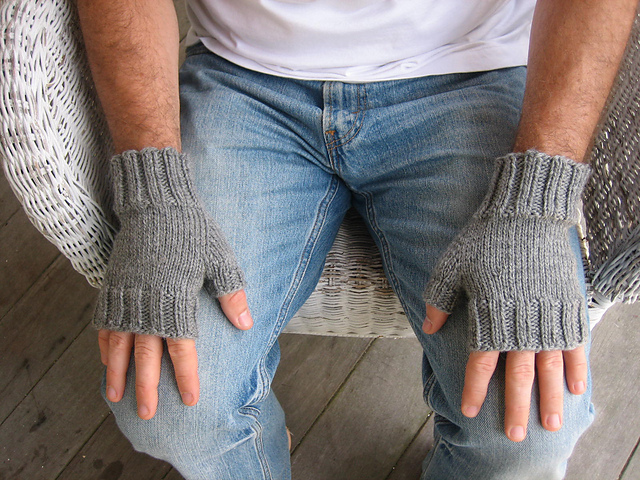 I also made a pair of fingerless mitts for my father and brother, who share the same birthday. 4. I’m currently working on something NOT on my list, as I just found out recently about it: an Owlie Sleep Sack for the my new niece/nephew who is expected in February! I found the pattern at Ravelry (of course) and it’s adorable. My very first cable project! I finished that part last night and am very pleased with how the owls came out. I find it’s a little tricky maneuvering the cable needle, but I’m sure I’ll get the hang of it. I really, REALLY wanted to find a nice yarn for this project; for it to be an heirloom piece. I was loathe to knit with acrylic again, but I was worried about wool being to scratchy and/or too difficult to care for. Lo and behold, I was ecstatic for find a very soft, hand dyed, 100% superwash merino wool that can be machine washed gentle and machine dried on low temperature at my LYS! It’s called Lorna’s Laces Shepherd Worsted and the colors are fabulous. I tried to pick something gender-neutral and came up with a beautiful blue/green/purple mix. Next up for September I have my mom, who I plan on knitting slippers for, and my neighbor, who I’m going to make a calorimetry for. I guess that’s all for now. Happy Knitting!